Boron has been running Fedora since it was intitally built several years ago. It has suffered from frequent problems all the time it has been in use, and recently I gave up and have gone for something more solid and stable – Ubuntu. A few weeks ago I entered the Homebrew Challenge on ZDNet.co.uk. The competition was centred around technical projects that people have done in their spare time, so I submitted my projects. The prize was a £20,000 Toyota Prius (a petrol-electric hybrid) courtesy of Intel. This competition was really the spark behind my push to get this blog going with information about my projects and ideas as well as some incentive to progress the current projects, so at the time I thought that even if I didn’t win a lot of good would have come out of it. 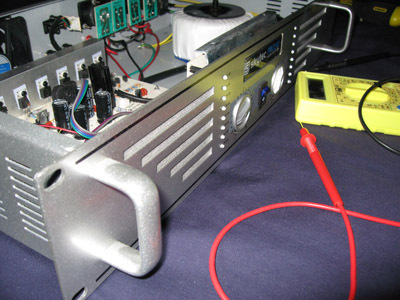 With the permission of ZDNet the posts on this blog were replicated in the Homebrew Blog. The Homebrew Blog is a new community blog on the ZDNet UK site, which gathers together homebrew-related posts from several blog authors. As far as I’m aware there aren’t any other similar collaborative blogs out there for this subject matter. If you know of any though, please let me know. After a couple of weeks of DIY and blogging I received a call from the community manager at ZDNet, Karen Friar. A few seconds later I stood on the 1st floor landing of our building in amazement at the news that I had won the competition. I had won a £20,000 car! Naturally my parents were the first to know, alongside my friend Matt who was within earshot of the conversation. Needless to say most people couldn’t believe what I was saying – nor could I. I had told a few people at work that I was entering the competition, mostly so that I could finally explain the purpose of all my wierd deliveries, but normally such an act combined with getting-my-hopes up would just result in disappointment – but not this time! The following Tuesday I had the day off work to demonstrate my project to the editor of ZDNet.co.uk and have it recorded on video. It was nerve-wracking to say the least, but Matt and Ashley were really down-to-earth and nice guys which put me at ease a little. They were also quite knowledgeable about technology, but in hindsight that shouldn’t have been such a surprise with them being from behind a well-known technical site. The video has been edited together, and is available on the ZDNet UK site (on the homepage as I write this). I’m not photogenic at all, so multiply that problem by about 25 times per second and it results in me not being very videogenic either. Fascinating to hear that my voice is lower than I thought though! Do I really sound like that? I’m going to stick to working behind the camera rather than appearing in front of it. Originally the car was supposed to be delivered while the video was being shot, but it had to be delayed. The car arrived on the Thursday from Croydon. Another pleasant gentleman drove it to my house and explained pretty much everything about the car – though it still hadn’t sunk in at that point that the car was mine. I had to get straight off to work though, so I didn’t get chance to drive the technology-packed £15-a-year-tax 65-mpg-combined blue car until the weekend. This is my first automatic car, so my first experience at driving it was a little jerkey. I’m glad I didn’t leave the driveway that time, though I almost went through the hedge. The brake is extremely sensitive, especially at low speeds. For the record my previous car was a 4-year-old 1 litre Corsa (a nice little car) and before that an 11-year-old 1.4 litre Astra (a battered, manual-everything car that’s been through almost the entire of my mum’s side of the family). The first upgrade was a major step, and this one is a fantastic leap! I have now driven the car on 3 trips, ferrying the family about. It’s a real pleasure to drive. No more aching foot from controlling the clutch in queues! I’m still getting used to it, so I can’t even use the steering-wheel mounted AC/audio/navigation/phone controls at the moment. The sat nav has had one chance so far, and it was OK that time. I’ve programmed it to get me to my next destination on new year’s eve in the middle of Birmingham. That should be the real test for it. I wouldn’t dare venture into Birmingham without satnav. I’ve already thanked them many times, but thankyou again to ZDNet UK and Intel for such a great competition and a fantastic prize. It has really made my Christmas. After finding out that the two tuner cards I already have are too large to fit in the new Camulus case of the new MythTV master backend (aka sodium), I ordered a Nova-T 500 dual-tuner PCI card. This was a little risky because Hauppauge produced a limited run of cards for the UK that are not compatible with linux. These cards are normally identified by their model number and certain stickers on the box. I received yet more odd looks and comments at work when a few weeks ago I received a delivery of 24 foam tiles. I ordered them from eBay as an experiment in trying to reduce the amount of noise eminating from the rack cabinet. At about £30 it was a bit of a gamble. Happy Christmas everyone! There will be a flurry of posts soon, which have built up over several weeks of being too busy. They will include some fantastic news. Here are some initial interface wireframes for the iPod Touch remote control. I’ve not shown all of the menus because that would be quite a bit of work. These three should give you an idea of what I intend to do though. 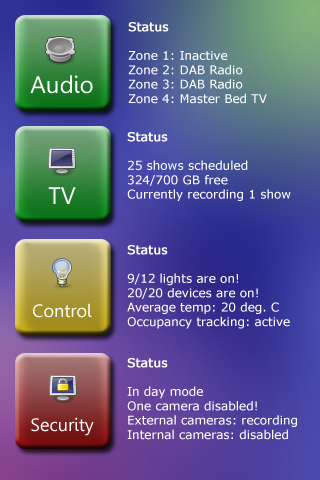 The main menu summarises the major systems of the house. Clicking on one of the buttons takes you to more controls for that system. The colour of the buttons indicate the overall state of the system – green = OK, yellow = warning, red = error, grey = disabled. 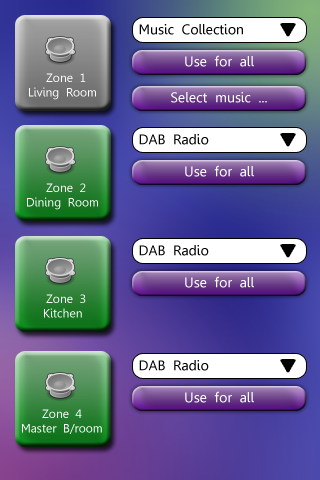 The audio controls will list the 4 zones, with a drop-down menu next to each button to select the audio source. Clicking the large button switches the zone on or off. Pressing the ‘Use for all’ button copies the settings of the selected zone to all the other zones. The large buttons display a thumbnail of the live video from the cameras. Clicking on the large button will show the full video feed (resized to fit the iPod’s screen). 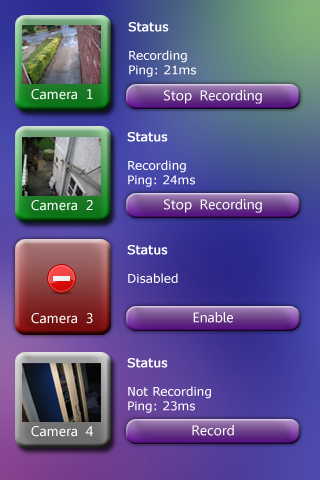 Cameras can be disabled for privacy. Each of these nodes can then be queried, via the xAP protocol in this case. Temperature could be recorded, although at present our combi-boiler would probably not allow for remote control. Motion detection and door contacts can be used to determine which rooms are occupied, and along with the window sensors could be used as a secondary security system. The light sensors would be used to control the house lights. Having one single ‘node’ to talk to would do away with having lots of independent sensors that would probably all communicate differently. Thanks to having picture rail throughout most of the house, there won’t be a problem with hiding the wiring. I’m not sure how big the boxes would be, but I dont think they would be massive. I just need to find the money to build a prototype. Today I took a look at the damage caused by last weekend’s test of the matrix switcher prototype. I suspect that the cause of the bangs was actually a short because in my haste to test I’d only connected one channel to a speaker and left the other with bare ends – oops! 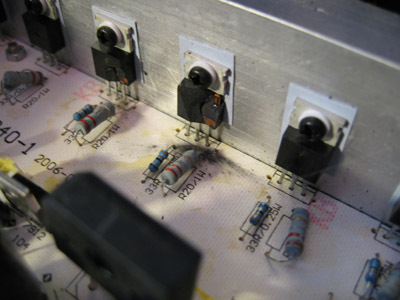 Removing the case revealed that the damage appears to be limited to two transistors on one of the channels. I’m not the only person who’s tried to fix this model of amplifier so a quick search for the numbers written on the remaining transistors revealed the information I needed to order some replacements. The parts have been ordered, so will hopefuly arrive before Christmas, although delivery times recently seem really slow. In the same way that the saying “you’ve got to spend money to make money” works, sometimes it’s also necessary to spend energy to save energy. An automated home may have more gadgetry than normal homes, but if set up correctly these little power-consumers can help to save energy. While the debate about whether the apparent global warming trend is the result of our actions, it can’t hurt to try to reduce energy use (or rather, conversion) as much as possible.